We are often approached by clients looking to maximise the space in their property through the addition of an extension. Whilst it may sound simple enough, there are many important considerations to be made when joining a new structure to an existing one and it isn’t always an easy process when each project is different with a unique set of challenges. Architects need to determine how a potential extension might impact upon what is already existing at the property, even if it is not always immediately visible. Drainage is a prime example of this – architects need to check the position of drains, if they are private or shared, they will also look to see if there is a need to contact the water board for a build over sewer agreement. There are other types of considerations to be made also. For example, will a potential extension be a concern for neighbouring buildings? Will the extension obscure the view for next door? Will the proposed window placements be a cause for complaint? If the extension is to be built astride a boundary wall then a party wall agreement will need to be in place. Architects will also think about how the local planning office may respond if the proposed works extend beyond permitted rights development, they will also be checking if there are certain legal permissions that need to be adhered to. Whenever there is a modification to an existing building, then there is a need to apply for building regulations in order to obtain Building Control approval. This means submitting a set of drawings to the local authority and having on-site inspections by the Building Control Officer during the build. Is the site within a conservation area or an area of ecological interest? If the development is within a conservation area then the planning application will need to be assessed by Conservation Officers as well as going through the usual local authority procedures, where a Design and Access statement explaining the designer's intended design ethos needs to be submitted also. Are there physical concerns with the build? Will certain materials need to be used or avoided? How will the new structure attach to the old building in a way that will ensure it is watertight, insulated and sound proofed? These are just a few examples in which an architect may need to examine, plan and research in detail prior to the fun part of actually designing your build. Your architect will be able to advise you of the individual concerns for your property at initial visits and solutions for how they will overcome these obstacles. Once architects physically find a way to connect the new to the old, whilst designing a structure that both addresses potential challenges and at the same time satisfying the client’s design brief, they then need to be able to communicate all this information across to the contracted builders. So as you can see there is a vast amount of work that goes in behind the scenes before a builder even steps foot on site. Our very own practice has great experience with extensions for both residential and commercial schemes and we currently offer a free 1 hour consultation to discuss new projects. 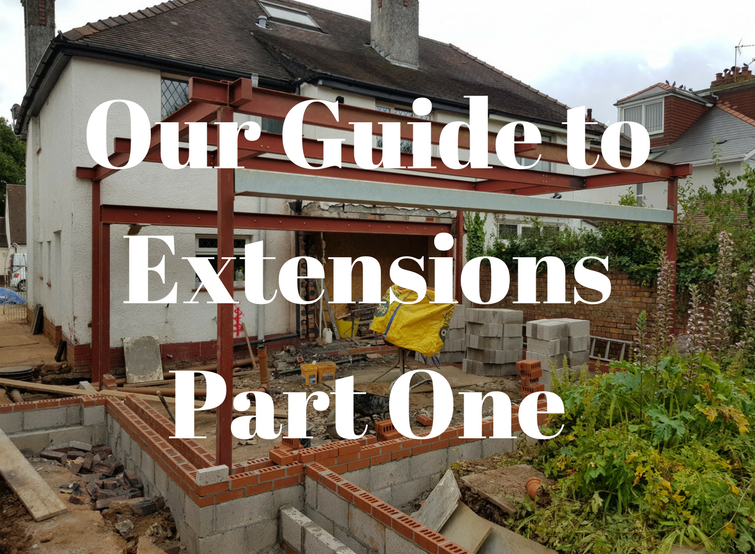 Part two of this post, will showcase a recently completed residential extension from the design brief right through to the completed home. It is a great opportunity to become familiarised with the stages of work involved, get an idea of how we looked to overcome the challenges for this particular scheme and see through a series of photographs how our client’s ideas are refined and brought to life. We also have a testimonial from our client explaining how she found the process of working with us. Packed full of top tips and advice it is not to be missed. You can keep up to date of our latest news and blogs here and please feel free to contact the team on 01633 744144 to discuss your own project.